Here's 10 Chocolate Free Easter Gift Ideas the Whole Family Will Love! Steer clear of the sugar highs (and lows) this Easter with a CHOCOLATE FREE Easter! That’s right, NO chocolate. Nada. Zilch. 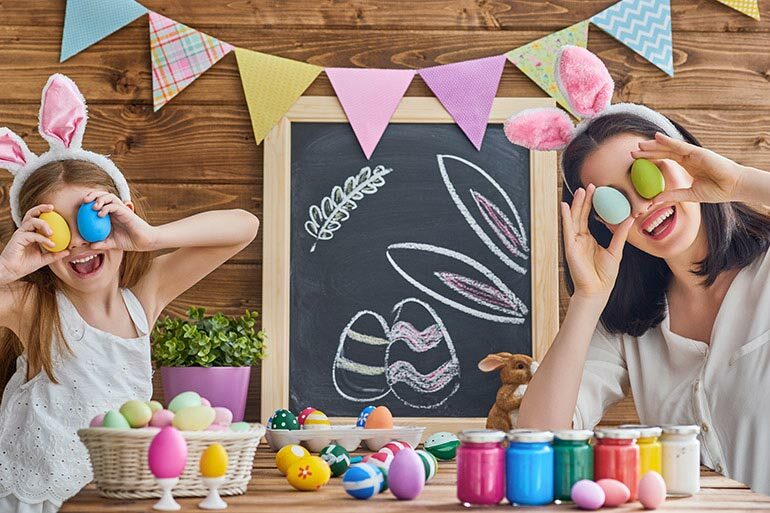 How about an Easter of no chocolate-induced tantrums, no trails of foil wrappers and definitely not any hiding in the pantry eating the kids chocolate egg basket? Us too! A no chocolate Easter doesn’t mean no fun though! Regardless of WHY you choose to go chocolate-free, we have some super special chocolate-free Easter gift ideas you can shake a bunny tail at and more. The Fox and Finch Bunny Stripe Dress ($54.95) is as comfy to wear and play in as it is easy on the eye. 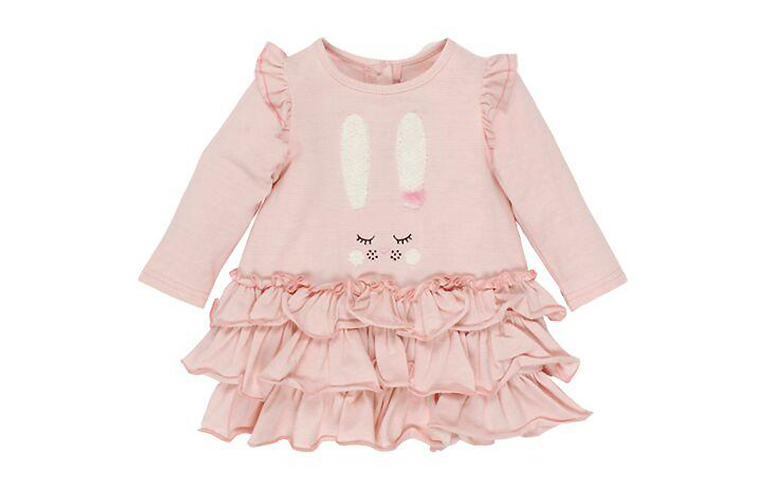 Beautiful in soft pink Eloise stripe and emblazoned with a cute as a button bunny motif, the long sleeves are perfect for autumn. I’m willing to bet this is one dress that will have to be prised off little bodies in order to be washed. Set to become a wardrobe favourite, little ladies will love showing off this twirl-worthy dress! Tiny dancers and lovers of all things pretty will adore the three-tiered ruffle hem detail and the gloriously frilly ruffle shoulder detail. The Fox and Finch Bunny Stripe Dress is available in sizes to fit 3 month-olds to 2-year-olds. Pair it with leggings or tights for a ridiculously cute Easter outfit! BONUS OFFER: 15% off for all Mum Central readers using the code ‘mum15off19’. Not valid for sale items. 2. Sophie the Giraffe Toys! Everyone’s favourite giraffe, Sophie, is loved by children all over the world with her sweet face and easy to gnaw at legs and ears. Bliss! A true toy box classic, Sophie the Giraffe teething toy ($37.90) is carefully designed to trigger all of your baby’s five senses: hearing, smell, touch, sight and taste. Sophie teethers are made of 100% natural rubber and A grade vegan food paint. Lightweight and easy to grab, Sophie will make your little one’s Easter. 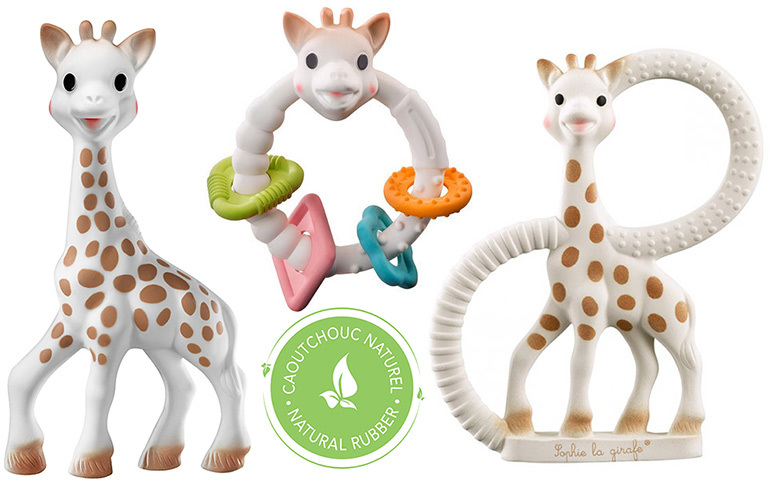 Sophie the giraffe fans will love expanding their Sophie collection with the easy to grip and easy to mouth Sophie So Pure Teething ring ($25.50) and what could be more fun than Sophie So Pure Colo’rings ($29.90), a terrific toy combining Sophie with four colourful different shaped rings to play with! BONUS OFFER: Now is a great time to secure a Sophie of your own with an awesome 10% off store-wide using the code ‘SOPHIE10’. 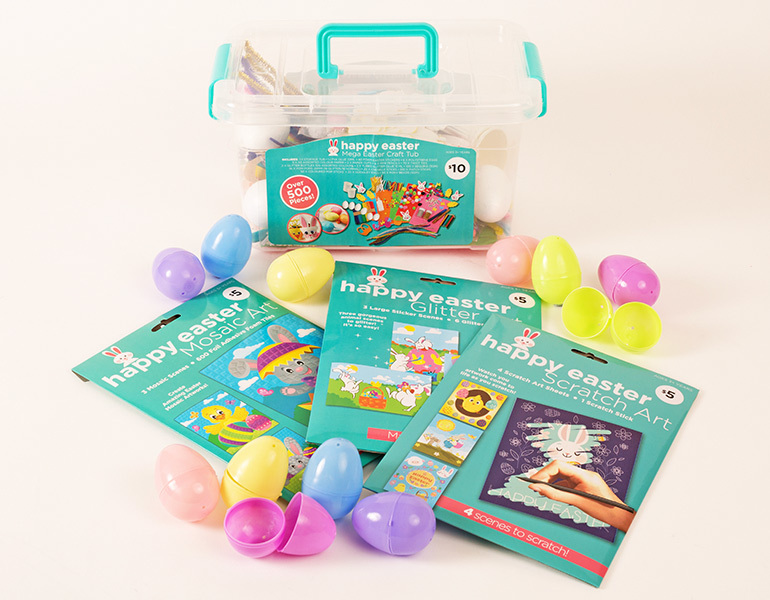 Is there any greater way to amuse the kids all Easter weekend long than with ALL the Hunter Leisure Easter craft from Big W? The Easter Mega Craft Activity Tub ($10) is packed to the brim with over 500 pieces of awesome craft stuff. This mega tub contains PVA glue, foam stickers, polystyrene eggs, pencils, glitter, chenille sticks and googly eyes to name just a few. It contains all you need (and more) for kids to create cards, bonnets, baskets for everyone, ALL the fun things! If the Easter Craft Tub isn’t enough to whet the crafting appetite, there’s also the Easter Stencil Scratch Art Kit ($5), Easter Stencil Mosaic Art Kit ($5) and Easter Stencil Glitter Art Kit ($5) for littlies to flex their artistic muscle. The fun doesn’t stop there – for your Easter hunt, Easter Hunting Eggs ($2 for a dozen) are perfect for hiding lollies and small trinkets. Just the ticket for us who are avoiding the chocolate egg variety this year! Pillow Pet ($29.99) gets our vote for being one of the handiest (and CUTEST) toys getting around. 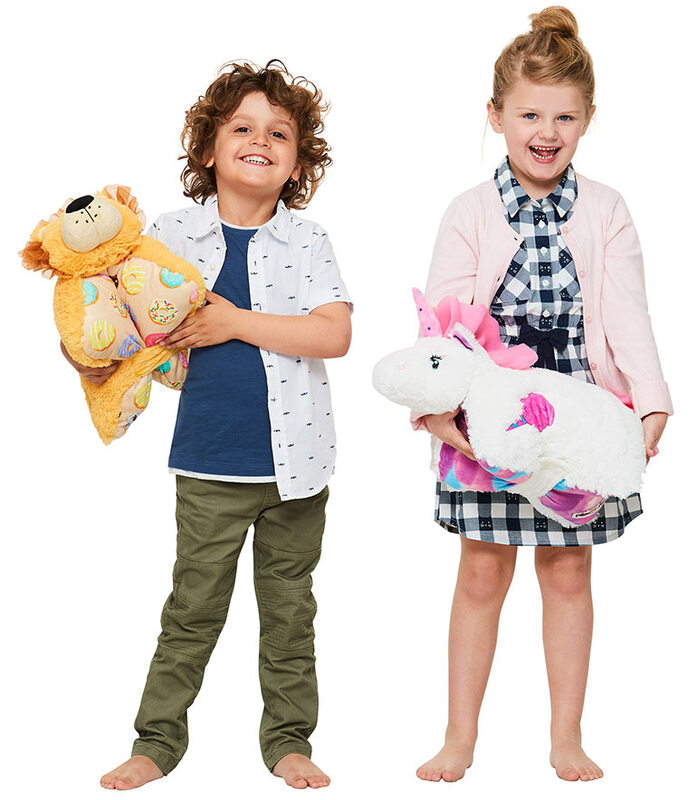 Perfect for playtime AND sleeptime, it’s a pillow, it’s a pet – it’s a Pillow Pet! Flossie Unicorn Pillow Pet makes for a sweet gift any lover of all things unicorn. So magical Flossie is with her flowing mane and matching tail, she even smells like cotton candy! Linus the Lion is fiercely loyal to his owner, loves to snuggle AND smells of doughnuts! Newly appointed Pillow Pet owners can even print an adoption certificate to proudly show off and officially seal the ownership deal. Sweet! BONUS OFFER: Get 10% off Pillow Pets for the ENTIRE month of April, using the code ‘MUM-10’ at checkout! No job is too big, nor no pup too small with the new Paw Patrol Ultimate Rescue range – and they’re just the ticket to saving you from a chocolate-filled Easter! There are six Paw Patrol Ultimate Rescue vehicles ($24.99) and six Ultimate Rescue mini vehicles ($14.99) to collect. The new vehicles come packed with a whole lot more awesome features and moving parts, PLUS they can fit up to two pups inside. Little imaginations will be rife with all manner of Easter rescue missions with the Paw Patrol Ultimate Rescue team in tow! The hunt for Easter treats is about to get a whole lot cuter with super sweet Stuck On You Easter Hunt Pack ($34.95). Children will love having their very own eggstra special and personalised wooden signs giving clues as to where goodies may be hidden. 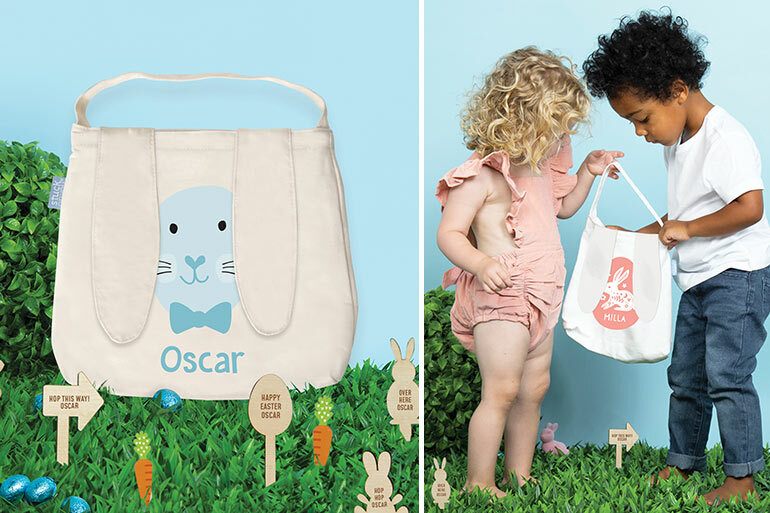 No hunt is complete without a bag to haul your loot, and with a personalised Easter Hunt Bag ($24.95), there’s no mistaking whose new-found Easter haul belongs to which little bunny. PLUS, this bag has the most adorable floppy bunny ears you’ll ever see, deeming it an absolute must-have. BONUS OFFER: You can get an amazing 10% off all Stuck On You Easter products! Use the code ‘MCEASTER’ at checkout to claim your discount. We can unanimously agree there’s surely no sweeter way to light up the darkness of the night than with this rather dapper Teeny and Tiny Rechargeable Bunny Light ($59.95). A glowing bunny for kids to love, this portable night-light is made from soft kid-friendly PVC and standing at 15cm tall, it’s the perfect size for little hands. 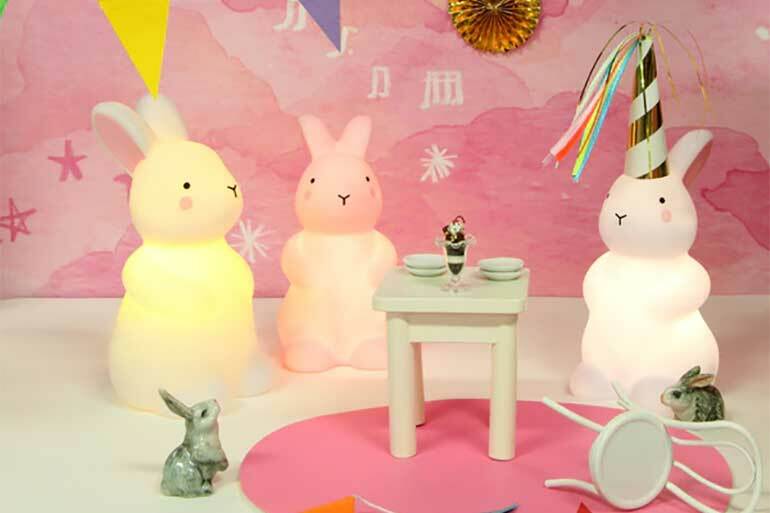 A clever bunny, the internal LEDs provide a comforting glow to your little one’s room. Choose from either a bright or dim light that will fade off after 30 minutes or can be set to stay on all night. There’s no battery to worry about either, the bunny light comes with a charging station AND after a full charge the light stays lit for up to 12 hours! 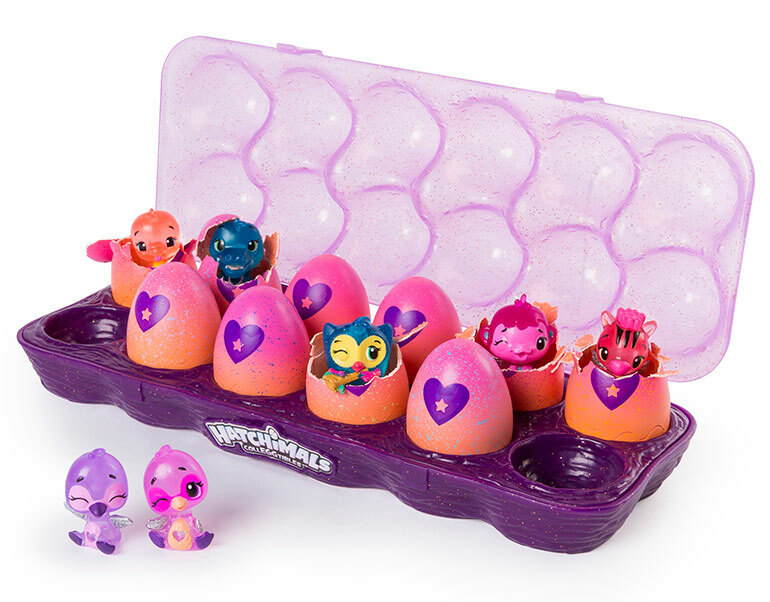 For the kind of eggs to collect and keep but most definitely not eat, the Season 4 Hatchimals CollEGGtibles 12-Pack egg Carton ($39.99) make for some serious Easter fun! Filled with 10 in-egg, yet to be hatched Hatchimals and two exclusive Swanlings, kids can spend the Easter weekend hatching their new friends. Hatching a Hatchimal is easy too! Hold one egg in the palm of your hand and use your love and care to warm up the egg! Rub the purple heart until it turns pink, then press down and crack the shell to meet your new friend! The fun doesn’t stop there, place these Hatchimals in any kind of light and they’ll shine bright! When all the hatching is done and dusted, the hatched Hatchimals can be placed into the egg carton’s plastic nests. Purple, glittery and durable – the super fun Hatchimals CollEGGtibles egg carton is perfect for the kids to take their new friends with them wherever they go! He’s covered in silky soft Jellycat fur with long floppy ears and a beautiful pink button nose, this Jellycat Bashful Cream Bunny ($37.95) is the perfect Easter bunny to come visit – and stay, for keeps! Irresistibly cute for both little girls and boys of all ages, this adorable Jellycat bunny is set to become a treasured friend for life. 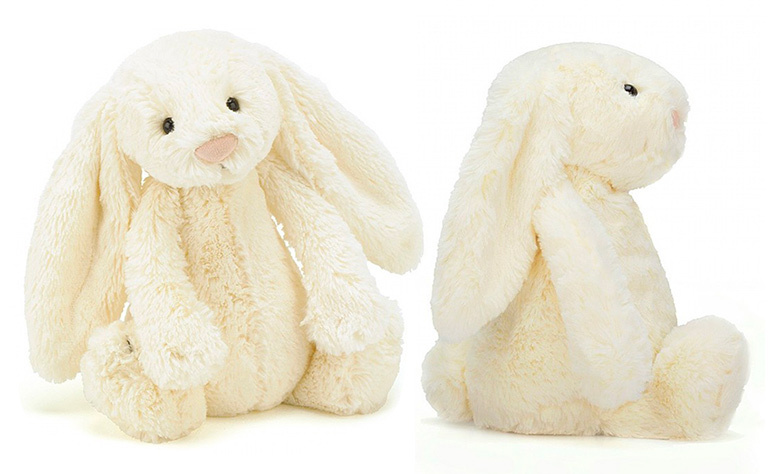 BONUS OFFER: Shop for your Jellycat bunny now and get a whopping 20% off the price! Use the discount code ‘mumcentral’ at checkout. One thing you won’t have to worry about with a chocolate free Easter is spotty skin – but that doesn’t mean you have to miss out on the gross fun of popping pimples. 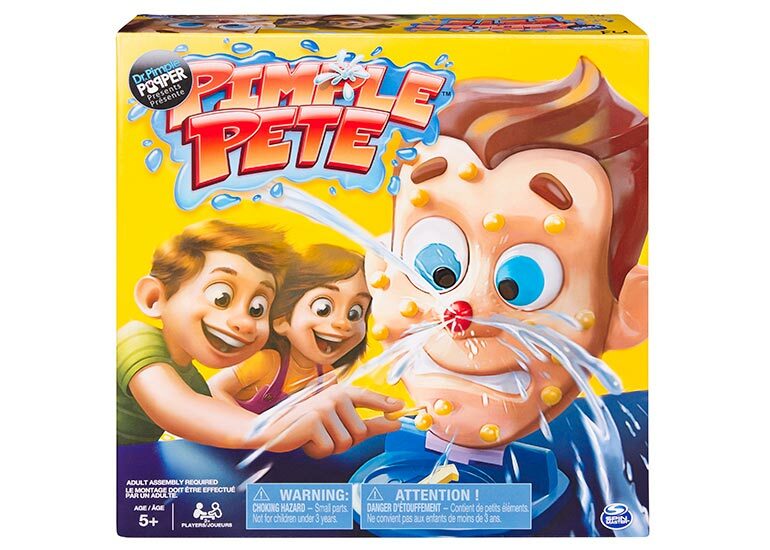 For some ewwww inducing fun (rest assured, the kids will LOVE it), the Pimple Pete board game ($29.99) is a pressure-packed, pimple popping game the whole family can play. Word of caution though, pop carefully or you risk being squirted by the Mega-Zit. It won’t hurt one bit – except for the belly laughs! For even more chocolate-free Easter fun, check out these free Easter printables and Easter crafts for the kids! Fabulous prizes! I have my fingers crossed for a win. Good luck everyone! A wonderful read & great suggestions, thanks for an opportunity to win these amazing prizes and good luck everyone. This is a great giveaway, with some really nice things. Thanks so much. Good luck to everyone. I love this prize pack, a little something for everyone to share.